Everybody's working for the weekend! - Stop staring and start sewing! The kids have a bunch of stuff going on this weekend (birthdays, sleepovers, etc) so we are all making preparations right now. Asher is going to a slumber party at a friends house and it was recommended that he bring a sleeping bag. Well we don't have any boy sleeping bags (just pink princess ones the girls have had for years) so I had to come up with something suitable for an 8 year old boy in Arizona. And since there will be 5 other boys there it has to have a "cool dude!" factor. I took him to JoAnn last night and let him pick some fleece (with a little "guidance"). He liked the Navy one. 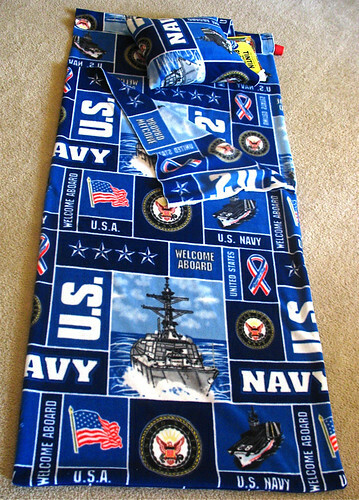 He also liked the Army and Air Force fabrics but I advised him that it would be best to pick the Navy in order to stay on his Grandpa's good side. So Navy it was. I was a little surprised at how pricey the licensed prints are but I think he'll get good use out of it (I think all the fleece is marked down starting tomorrow, but we needed it today). So I whipped this up in less than an hour (including a pillow cover) and he loves it! Fleece is great because you can leave the edges unfinished and your mistakes have to be huge in order to show. Here's the best part. 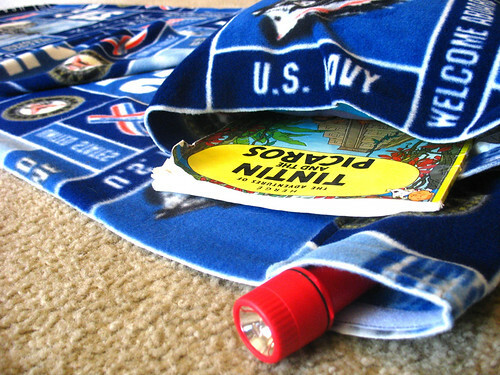 A pocket with velcro so he can hide a flashlight and I left the pillow cover opened so he can slide a book in there for some after-dark reading. I have a feeling I'll be making a few of these for Christmas this year. I called Free Spirit this week to check the status of my orders and it turns out David Walker's Robots fabric isn't shipping until the middle of December (waaaa!) so I will try to be patient. They just put Tanya Whelan's new line Darla on the public page so go take a look because it's gorgeous and it will be perfect for Easter dresses (that's shipping in mid-December too)! And be sure to visit Tanya's website because she is featured in the current issue of Country Home and oh my goodness! I picked up a copy last night. 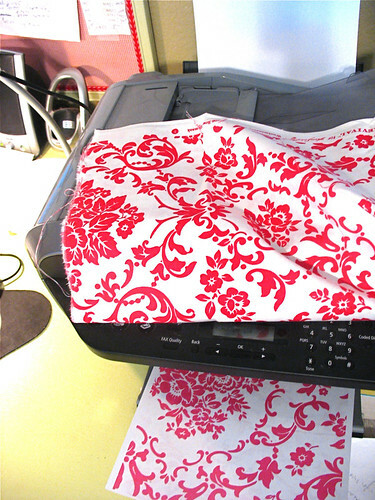 Such gorgeous ways to use her Ava Rose fabric! I've ordered a bunch more (due here next week) because I just can't get enough of it (and it sells fast) and I need something to tide me over while I wait for Darla. I tried one of the ideas from the magazine and I think I might be in danger of burning through my colored ink. Look! Gift wrap (for little gifts but great still)! And I gave the kids permission to pick through some of my scraps and Peety came up with something cute right away. She's had these little embroidery samplers for awhile and didn't know what to do with them. 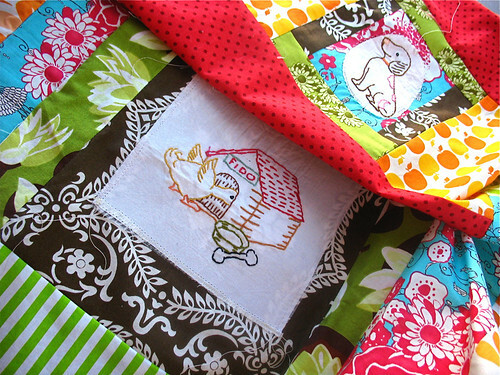 How cute is this quilt project?! Now we are off to IKEA (another weekend project beckons). Have a great weekend! !